The controversy surrounding the at least eight different complete versions of this painting. Complete versions have both Mary Magdalene and Martha. Incomplete versions have only Mary Magdalene. 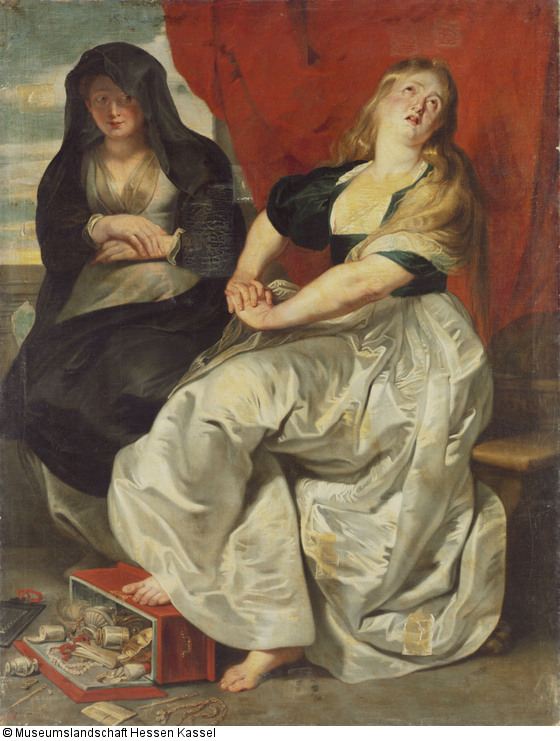 Rubens studio was known to have produced up to eight versions of a single painting in other cases. 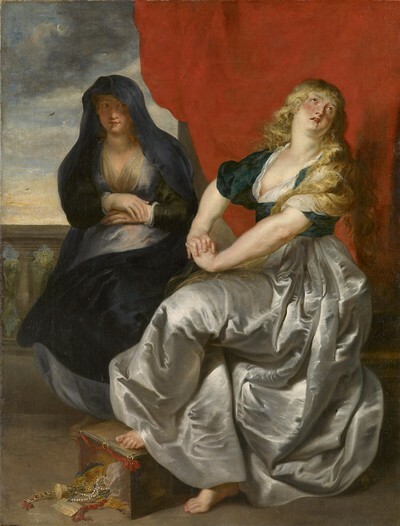 For this painting the current catalog raisonne only lists one original with no known variants done by Rubens Studio. It does however acknowledge the existence of a second version in an inventory of his possessions. In 2012 a version located at the Museum of Irbit in Russia was cleaned and examined by experts at the Hermitage and was found to have been done in part by Rubens and in part by Van Dyck with Jacob Jordaens. The State Museum of Fine Art at Irbit and the Russian Press are clearly presenting this painting as the original. Examination of the engraving by Lucas Vorsterman would indicate the presence of another now lost original. The article below outlines the cases for each version with photos where available. Note that the primary point of difference is the jewelry box and contents. Boxes in red, blue, black, and brass with and without lids. The purpose here is just to produce a list of known versions, not to pass judgment as to whether they are or are not by Rubens studio, for that an examination of each work would be required. This image was popular at the time and Mary Magdalene was depicted in other Rubens paintings with straight or more accurately wavy hair. An example is the closeup below from the Museum of Lyon of Two Saints Protecting the World from the Anger of Jesus Christ. Mary Magdalene center with an unidentified female saint on either side. Mary Magdalene as depicted in the painting of saints protecting the world from the wrath of Jesus found in the Museum of Lyon. Partial Versions are found here. 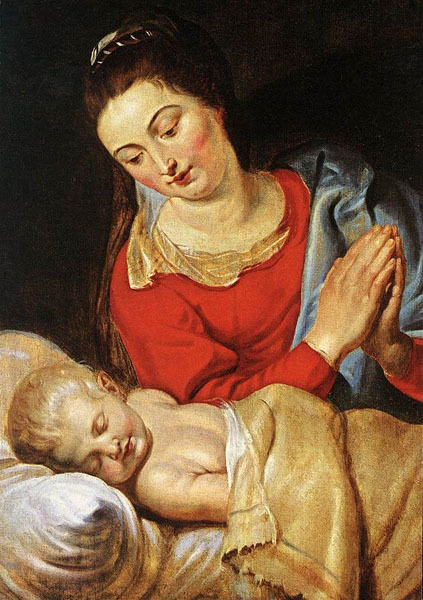 There are at least eight variations of this painting, they may not all be by Rubens studio, there are also two probable later copies and one a version that is derived from this image. The Catalog Raisonné, Corpus Rubenianum Ludwig Burchard Part VIII Saints part 2 by Hans Vlieghe, #129 page 117-118, lists 4 complete versions and 4 partial versions. The addendum on RKD Images adds 1 complete and 3 more partial copies. My search has found in total 12 complete versions and 15 partial versions. There is also a reverse etching by Lucas Vorsterman who seems to have worked in Rubens studio from 1617 to 1621. There is supposed to be an anonymous etching after Vorsterman in the correct direction (not found). The catalog raisonné describes an original in Vienna with curly hair and all others to be copies based on the anonymous etching after Vorsterman. This position is in direct conflict with the Hermitage in Russia that has authenticated as by Rubens with help from his studio, a straight haired version that is not included in the pre or post publication dossier on Saints II number 129 used by the Rubenanium to generate the catalog raisonné. These dossiers had no mention of this version as of October 11 2018 when I examined them. The Russian version has more similarities to the painting at the Museumslandschaft Hessen Kassel #2, Sothebys 2007 # 5, to the French version #9 and the partial version at the Staatliches Museum than to the Vienna version. 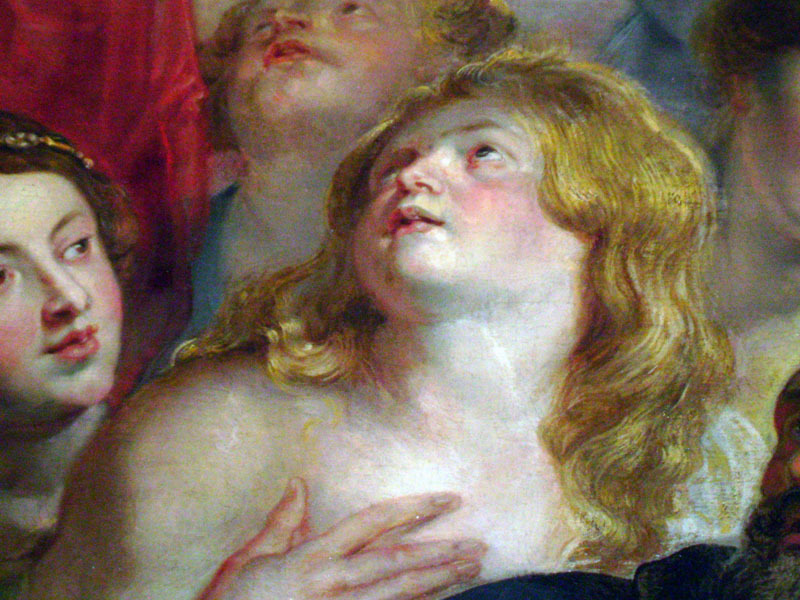 raisonné for Peter Paul Rubens. 1. Kunst Historisches Museum Vienna, larger, considered the original by some but still heavy studio involvement. Only marginally better than other iterations (per Rooses and Vlieghe). 205 x 157 cm. This is the only version where the Magdalene has curly hair and the only version missing a piece of cloth to the right of her hands. The Corpus Rubenianum Ludwig Burchard also lists the engraving done by Lucas Vorsterman as a copy of this painting. In fact the Vienna painting seems to be less like the engraving than several of the other examples found. Photo of the engraving is found below. The lack of a known painting close or identical to the engraving indicates a lost original (see Section on the study of Vorsterman engravings below). The first listed provenance for the Vienna version is not solid. Lugt 869, A sale in 1754 of the estate of Jacob de Wit , artist specializing in religious subjects, done in Amsterdam with measurements in Amsterdam voet, shows the dimensions of the painting as 7 voet x 5 voet 3 duim. Amsterdam units of measure are specified in the sale catalog. Using 28.3133 cm per Amsterdam voet and Amsterdam duim as 2.57393 cm. (11 per foot). This makes the total dimensions of the sold painting 198.19 x 149.29 cm. The actual size for the Vienna version is 205 x 157 cm a difference of 6.81 cm in height and 7.71 cm in width. It could be a sale for #5 Below at 195.6 x 142.2 cm. A difference of 2.6 and 7.1 cm. It may also be for the Russian version which has probably been cut down in height. Adding an appropriate amount of sky to the version at Irbit would bring its height closer to 198 cm. In any case it seems unlikely that this sale applies to the Vienna painting. This would leave the provenance for the Vienna painting starting at Paul Schukking; Galerie Graf Nostitz, Prag; 1786. 2. Museumslandschaft Hessen Kassel Listed as follower of Rubens on their web site in accordance with the Catalog raisonne description by Vlieghe. Rooses calls it a repetition (studio version). Inventory GK 1117 192 x 148 cm. Acquired before 1749 by William VIII. 3. Formerly coll. A. Le Bermuth, Ohain, Brabant, canvas, 175 x 100 cm. The image is very dark but the Magdalene has straight hair and the jewelry box contents are different. The jewelry box has no visible lid and a higher aspect similar to the Vienna version but the contents are certainly changed. 4. Sale, Brussels, 12 November 1928, lot 184, wood panel, 64 x 41 cm. Vlieghe and Rooses talk about the fact that a copy on wood panel existed in the inventory of 1626. (Denuce, KonStkamers, p. 72). So there are at least two versions before 1626. This panel or the one in the Danish Royal collection could be the one mentioned in the inventory. There is a halo around the head of Mary Magdalene not found on any other version. Additional complete versions with some mention in the post publication folder of the Rubenianum. 5. Sothebys Old Masters on October 18, 2000 Lot 136 in New York. The Magdalene repenting of her worldly vanities, 195.6 by 142.2 cm. Described as Circle of Peter Paul Rubens. No provenance cited. The image is the same as number 11 below but the dimensions are different. There are only some very minor differences in the form of the clouds in the sky and the sky visible through the balustrade is blue in this version and cloudy in the version sold in 2007. As this one is listed as Circle of and the 2007 version listed as Follower of, I would just hazard a guess that the 2007 version is a later copy of this one but this is pure speculation. Possibly Lugt 869 Jacob de Wit sale in 1754 done in Amsterdam 192 x 141 cm , currently used by the Vienna version. Possibly Lugt 15918 Abbey of Cambrai/Cambron?. Sale in Ghent, Sept 14 1840, 192 x 141 cm. 6. Danish Royal Collection – On panel 64.5 x 49 cm. Acquired before 1885. The unique feature of this painting is the jar of perfume on the right side of the bench. The jewelry box contents are different from all others. 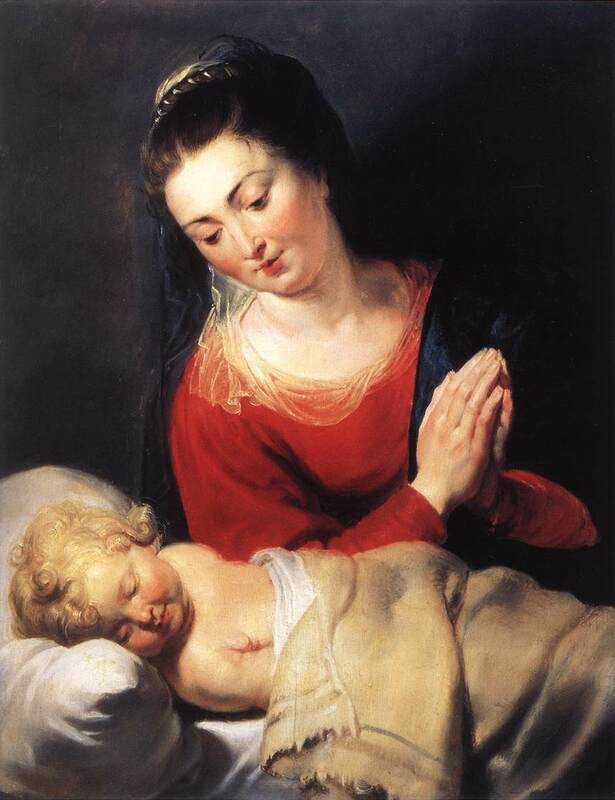 The painting is described in “Flemish Paintings 1600 -1800” by Olaf Koester in 2000. A copy of the relevant pages are in the post publication folder. 7. Painting photographed in Dusseldorf – 114 x 97 cm. Gudrun Wester, Solingen-Merscheid written on the back. This is some sort of altered version of the painting with many differences from the others, notably the fabric of the dress has an ornate embroidery patterning. Martha is behind the balustrade. Impossible to attribute this version to Rubens studio without further evidence. In technique it resembles another partial version with only the Magdalene and the same type of dress patterns. 8. A complete version located in Budapest 123 x 100 cm. The photograph in the post publication folder for Saints II #129 is so dark that nothing can be deduced except that it does seem to be the Magdalene with Martha in the correct direction. 9. Private Collection France, 152 x 117 cm. The painting was originally taller as the top edge has been cut unevenly. Lot 59 sold in Tienen Belgium in 1839 (Lugt 15499) as after Rubens. The sale in 1839 specifies that the painting was handed down in the family and originally belonged to Henri Rega (1690-1754). In 1716 he joined the faculty of the University of Leuven. He received the chair of chemistry of the faculty of medicine. In 1718 he gave courses in Anatomy. He had an immense reputation as a practitioner. He was the doctor for the archduchess Marie-Elisabeth of Austria and Charles of Lorraine, governors of the Austrian Low Countries. His statue is one that adorns the Leuven town hall. he had a large mansion built in the Parijsstraat with courtyard and horse stables, and a very rich collection of books. It was lavishly decorated. No known expertise has been performed since the sale in 1839. The painting was cleaned in 2018 due to an opaque varnish that reduced the image to an outline. 10. Irbit Museum Russia, examined by Hermitage director of restoration, product of Rubens studio. The Russian press notes that chemical analyses confirm the production in Rubens studio. The first known owner of the painting was the St. Petersburg professor Alexander Yakobson, who in the middle of the 19th century bought the canvas for his collection of paintings. Thought to be after Rubens till 2012 cleaning. 180 x 152 cm. It seems to have been cut down in height and using 13.8 percent of the height over the head of Martha, same relative amount as the Vienna painting we can estimate its original height at about 198 cm. If this height were correct then Lugt 869 is much more likely to be the Russian version and not provenance for the Vienna version. 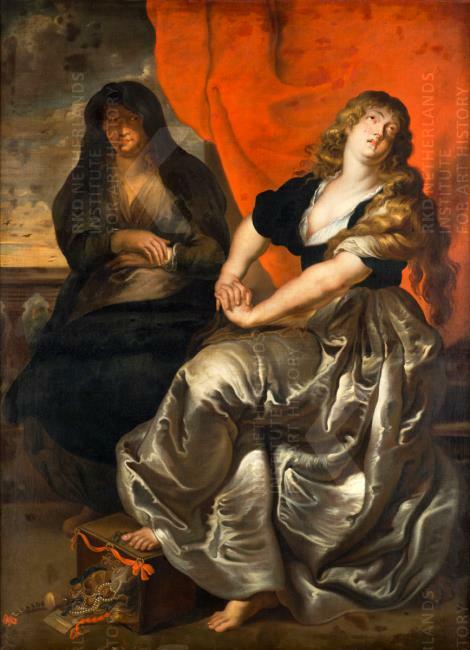 This painting has received significant press in Russia and has been presented as an earlier copy than the one in Vienna, also with the participation of Van Dyck for the sister Martha and also Jacob Jordaens. The painting has now been re-framed circa 2014 and placed inside a bullet proof glass case. It has been doing a one painting touring exhibit in different museums in central Russia. Attempts to contact the State Museum of Irbit for clarification go unanswered. 11. Sothebys November 1, 2007 Lot 52, The Magdalene repenting of her worldly vanities, Sothebys Old Masters. London sold 10,000 pounds. 181 by 131 cm. Described as follower of Peter Paul Rubens. No provenance cited. The image is the same as number 5 above but the dimensions are different. There are only some very minor differences in the form of the clouds in the sky. The sky visible through the balustrade is cloudy in this version and blue in the version sold in 2000. As this one is listed as Follower of and the 2000 version listed as Circle of, I would just hazard a guess that this is a later copy of the Sothebys 2000 version but this is pure speculation. The photograph taken directly from the catalog is not very good so it renders any meaningful comparison impossible. 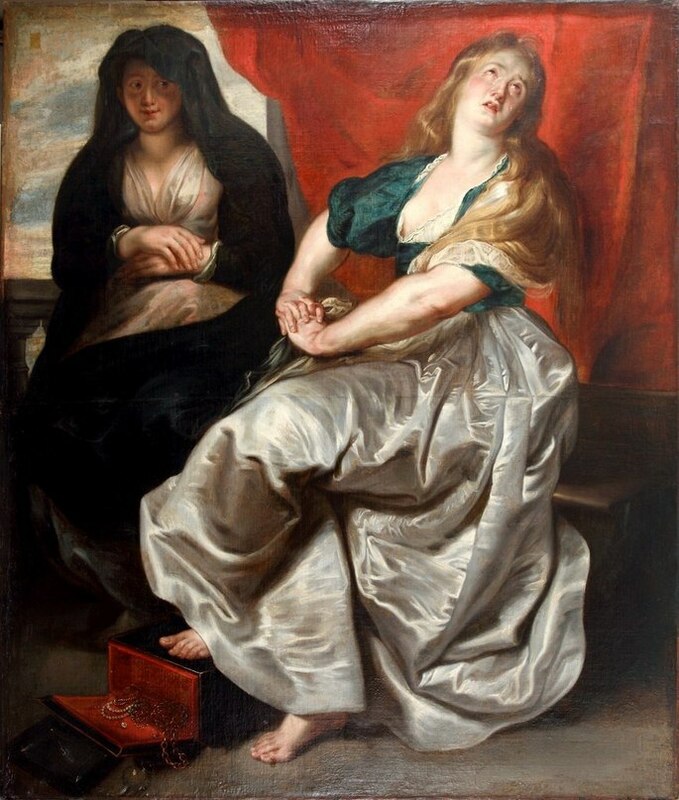 Mary Magdalene and Martha after Peter Paul Rubens. Photo from RKD Web site. 12. Rychnov Chateau Prague Slavata family, – Seems to be an exact copy of the painting in the Vienna Museum, even the dimensions are very similar. 202 x 150 cm. In the chateau before 1716. Listed as after Rubens on RKD website. This painting does not seem to fall in the same category as the others. The fact that it is an identical copy of the painting in Vienna, owned by a family that had houses in both Prague and Vienna at the time of first record, lends to the conclusion that it is in fact a later copy probably not done by Rubens studio. While I found no mention of this painting at the Rubenianum it is listed on the RKD Website with this image. 13. The lost original – The evidence presented indicates the existence of an original straight haired Mary Magdalene probably close to identical with the Vorsterman engraving seen below. This painting is in a location unknown or has been destroyed. There is some remote possibility that one of the known versions could in fact be the original, possibly altered by restoration. 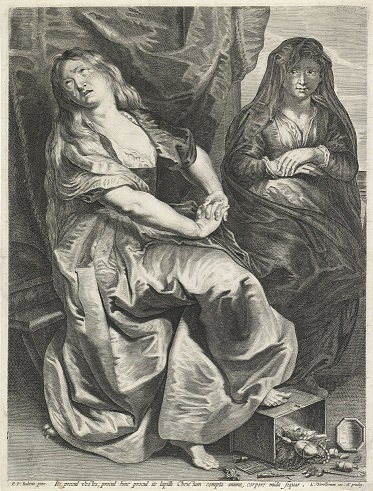 Engraving done by Lucas Vorsterman of Peter Paul Rubens Mary Magdalene and Martha. 2nd form without his address at bottom. Certainly before 1640 and probably while employed by Rubens 1617-1621 as it bears an inscription as to Rubens publishing rights. Mentioned in the Catalog Raisonné . More Detailed Study is located here. 32 engravings made by Lucas Vorsterman after Rubens paintings were compared against known Rubens paintings to determine if the engravings were true to the original paintings. Most bear an inscription giving Rubens a sort of copyright protection granted to him in various countries. 2 do not give him any credit. 17 of the engravings showed no differences between the engravings and an identified original painting. 3 demonstrated very minor differences. An extra bird ect. 8 engravings could not be matched to a painting. The original is lost. 4 engravings showed significant differences from all known versions. 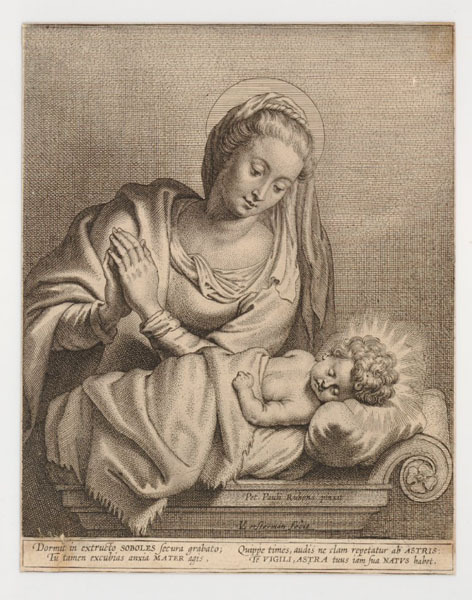 Hymans #40 – Virgin and sleeping child – Rockox house version is the closest to the engraving but the sleeping child’s arm is outside the covers and the bed is visible in the engraving. The curly hair matches the engraving. The other version has straight hair and the arm is hidden as well. Clearly it demonstrates that there are other paintings that have a curly and straight haired versions. It could be argued that the Rockox version is the original with the bed added as a framing element in the engraving, leaving only the small arm as a difference (possibly to hide an engravers mistake) and a presence of halos. Hymans # 45 – Holy Family – St. Peter has straight hair in the engraving and curly hair in the painting located in the Galleria Palatina (Palazzo Pitti), Florence. Hymans #80 – Mary Magdalene and Martha – Jewelry box contents and placement do not match any known version. The engraved Magdalene has straight hair. Some painting versions have boxes with lids and some boxes are more rectangular and of various colors. Hymans #56 – Saint Martina has been turned into Saint Catherine. To summarize, of 24 engravings done by Vorsterman where a good comparison was possible only 4 were significantly different from all known paintings, 2 of these are possibly just alterations in the engravings (#40 and #45) , and two probably due to lost originals ( #56 and #80 the Magdalene and Martha with 8 versions to compare). In all 4 cases the original painting may not have been found. 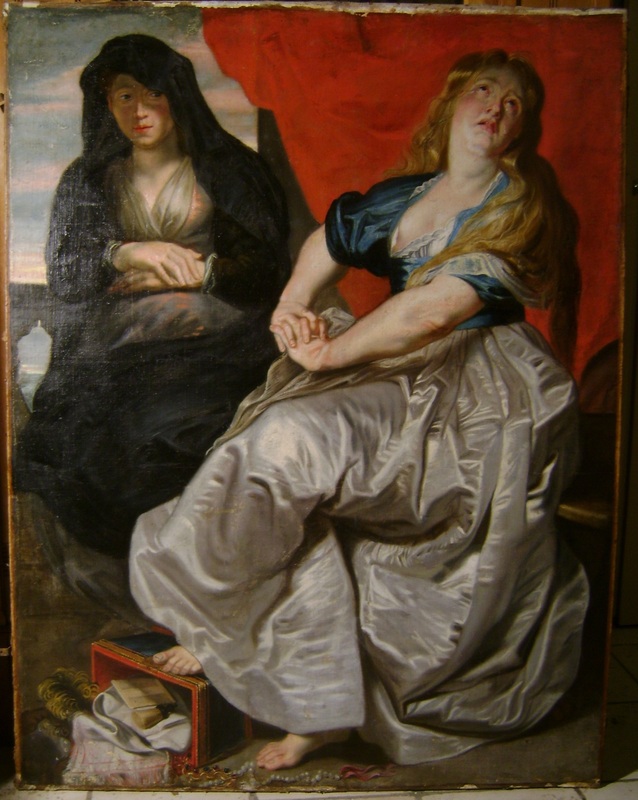 Vorsterman seems to have essentially been a copyist and evidence that he did other than minor alterations from the original paintings while working on Rubens material is lacking. Various experts consider the Vienna painting to have been created between 1615 and 1620. In it the Magdalene has curly hair. It has been designated the original even though the studio seems to have been heavily involved. The Rubens inventory of 1626 shows at least one Magdalene copy. The Vorsterman etching if done during his employment would have been within a few years of the creation of this painting and shows straight hair as do 25 of 27 versions of the Magdalene that I ‘ve located. Most specifically the Irbit Museum version which has been authenticated as Studio of Rubens by the experts at the Hermitage. If correct this means the Studio of Rubens was active in the production of a curly and probably several straight hair Magdalenes. The catalog raisonne states “ All these copies, however, are not based on the original but on the anonymous engraving in the same direction as the Vienna painting, which was itself made from the reversed engraving published by Lucas Vorsterman. They have the hard quality and lack of nuance of the engraving; moreover, precisely like the latter they show the Magdalene with long lank hair instead of the curly hair in the painting.” This is confusing but if I read it correctly he is saying that an anonymous engraver took the Vorsterman engraving reversed it as a new engraving and this became the source material for all subsequent copies done entirely by anonymous others. The conclusion is that since all the later copies have straight lank hair and face the same as the Vienna painting and are not as good they must be based on the anonymous etching after Vorsterman. I haven’t found any evidence that such an engraving exists. In the dossier at the Rubenianum there are some photographs of reversed engravings however it’s clear that these are simply photos of the Vorsterman engraving taken in a mirror as the text is also reversed. Taken in context the Catalog raisonne really only applies to The Vienna, Kassel complete versions and the partial versions at Staatliches Museum, Schaub-Koch and Wrexham. A total of 5 paintings. These seem to be the only versions with decent photos available at the time of publication. A interesting fact is that the incomplete version done by Jan Boeckhorst (1604 – 1668), who was active in Rubens workshop at a young age, has straight hair. A quick survey of Rubens and Van Dyck’s works shows that of a dozen depictions of the Magdalene done by each, there does seem to be a curly haired version done by Rubens. The Deposition at Villa Borghese, although it is not completely clear who the woman is holding Christs hand, a typical Magdelene figure is also behind him. Van Dycks “The Madonna and Child with the three penitent sinners” in the Louvre does seem to have a curly haired Magdalene. By far the great majority of both artists Magdalenes have straight or more accurately wavy hair. It would seem that any differences in the quality of the work would be more easily explained by looking at the work schedule of the studio as we have no idea who was working at any given time during the fabrication of these pieces. Also the rather dirty condition of at least the French, Russian and German versions would have covered up the nuances that the Corpus Rubenianum mentions. If correct that the Irbit painting is a product of Rubens studio, it would seem then the analysis contained in the catalog is no longer tenable. An alternative theory would be that Rubens studio produced straight hair versions and at least one curly haired version and the Vorsterman engraving is only a copy of one that was available in the studio. A point that seemed curious is that most copyists will try to make an exact copy, as close as they can get to the original. Differences in their technique or ability will often lead to subtle differences. With 8 different versions of the painting the different colored boxes were possibly a way of telling them apart. It would be much easier to say “Ship him the one with the blue box” rather than “Ship him the one that’s 155 cm x 117 cm.”. For six above paintings (1,2,5,6,9,10) the Magdalene and sister are exactly the same, (see Note) every fold in the silk dress is the same and yet in every case the jewel box is very different and none is the same as the engraving. Given that two of the six above paintings have already been authenticated and a third has provenance to around 1750 only 65 kilometers from Antwerp, there is reason to believe they are from the same source. #7 is too different to include in any comparison. #12 seems to be a direct copy of #1 and #11 a direct copy of #5 and are thus not included in the comparisons. A decent image of #8 has not been found. After all this digging my conclusion is that probably Vienna #1, Cassel #2, Brabant #3, Irbit #10, French #9 and Sothebys 2007 #5 will all eventually be confirmed as Rubens studio versions with an as yet to be found original. Some of the others may as well be found to be Rubens studio copies. #12 is probably a copy of the Vienna painting done later. #11 is probably a copy of #5. Interestingly this would make #11 and #12 the only obvious potential copies (#7 is more of a “derivation from” than copy) made throughout history, which makes sense as the effort involved to copy something this big is substantial. It sort of boggles the mind to think of some copyist deciding to make a series of 5 – 8 large copies of the Magdalene each with a different color box and different dimensions or even less credible that 5 individuals decided to make copies and all of them decided to just change the box. I think Rubens who was quite business savvy, knew he could sell 8 so have the studio make 8 and paint the boxes different so that when Van Dyck screws up a face, I can just tell him to fix the one with the green box. There seems to be little alternative that some of of these paintings came from Rubens studio, however the quality and participation of the master himself is yet to be determined for most of them. Note: The blouse color varies in different versions from light blue to black. This maybe original but may also be due to a removal of a darker final layer of paint during cleaning. This leaving a lighter blue underpaint visible. Some slight evidence of a darker layer existed on the French version before its cleaning in 2018. This might account for the higher contrast in certain sleeves.